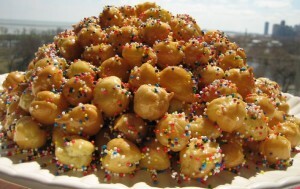 Pignolata: Pignolata is a Sicilian pastry, which originated in Messina and is also common in Calabria. Pignolata is made of small portions of fried pastry, like large pearls, in a hot honey sauce, with chopped almonds or hazelnuts. Before serving, they are set on a plate, as a crown, with chopped nuts sprinkled over the top. Pignolata is one of the most popular southern Italian sweets made for Christmas. It used to be made in Sicily during Carnevale, but is now also made during Christmas. Beat eggs, sugar, salt and oil in a large mixer. Sift the flour into the egg mix and beat on medium speed with a dough hook until you obtain soft dough. Add more flour as needed a little at a time if the dough is too sticky. Turn the dough out onto a lightly floured work surface and knead it until it is smooth. Roll each dough piece into ropes of about 1/2 inch thickness. Cut each rope into 1/2 inch pieces and roll the pieces in your hands (like you’re making meatballs) into little balls. Toss the rolled out dough balls with a little bit of flour so they don’t stick while you roll the other pieces. Heat the oil for deep frying, in a large heavy saucepan to 180°C. Add a handful of dough balls into the hot oil and fry till they are golden brown from all sides, takes about 3 minutes. Drain and place the cooked dough pieces on a paper towel lined plate. Repeat process until you have fried all the pieces of dough. In a large skillet, bring the sugar and water to boil. Whisk in the honey and reduce the heat to medium-high. Add the fried dough balls and stir, to coat them evenly with the honey syrup. Cook for about 5 minutes until they the dough balls obtain a nice glaze. Immediately place them on serving plate stacking them like a pinecone. Pignolata are ready to be served. Toss on the sprinkle, and serve the hot pignolata immediately. If you have any queries regarding the Pignolata recipe, please leave a comment.